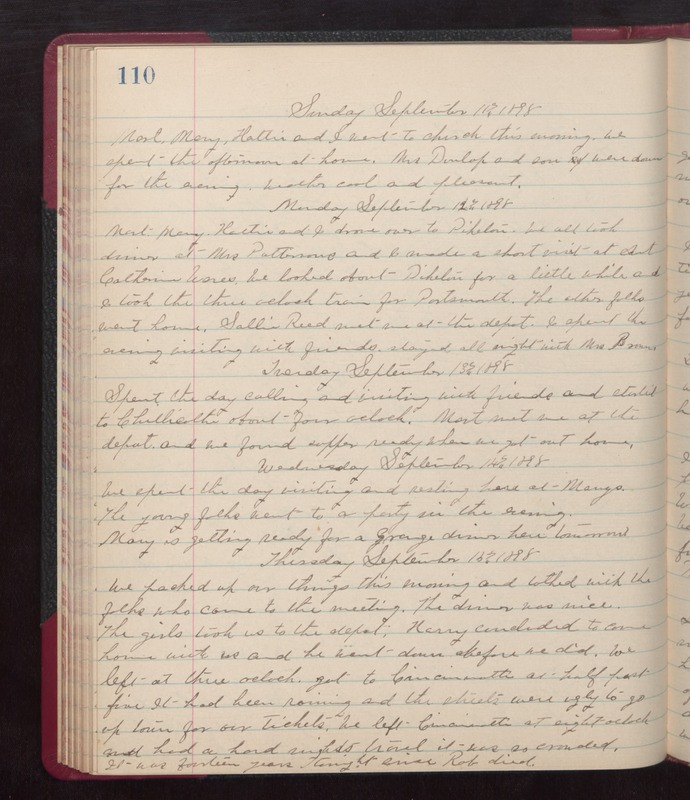 Sunday September 11th 1898 Mort, Mary, Hattie and I went to church this morning. We spent the afternoon at home. Mrs Dunlap and son were down for the evening. weather cool and pleasant. Monday September 12th 1898 Mort, Mary, Hattie and I drove over to Piketon. We all took dinner at Mrs Pattersons and I made a short visit at Aunt Catherine Wares. We looked about Piketon for a little while and I took the three oclock train for Portsmouth. The other folks went home. Sallie Reed met me at the depot. I spent the evening visiting with friends. Stayed all night with Mrs [Bremmer?] Tuesday September 13th 1898 Spent the day calling and visiting with friends and started to Chillicothe about four oclock. Mort met me at the depot and we found supper ready when we got out home. Wednesday September 14th 1898 We spent the day visiting and resting here at Marys. The young folks went to a party in the evening. Mary is getting ready for a grange dinner here tomorrow. Thursday September 15th 1898 We packed up our things this morning and talked with the folks who came to the meeting. The dinner was nice. The girls took us to the depot. Harry concluded to come home with us and he went down before we did. We left at three oclock, got to Cincinnati at eight oclock and had a hard nights travel. It was so crowded. It was fourteen years tonight since Rob died.